Earlier this year, Nintendo revealed the Nintendo Labo: VR Kit, the fourth release in its Nintendo Labo line, which allows kids and adults to create controllers (called Toy-Con) out of cardboard, and use them to play games on special Switch software. The first Nintendo Labo kits, the Variety Kit and Robot Kit, were released in April 2018. The Vehicle Kit launched in September 2018. The Nintendo Labo: VR Kit will be released on April 12. It will let kids and parents create six new Toy-Con out of cardboard: a blaster, camera, bird, wind pedal, elephant, and VR goggles. When the kit was first announced, we didn’t know much about the actual games users would play with these Toy-Con (other than being able to fight aliens with the blaster and take pictures of underwater creatures with the camera). However, we now know there will be “dozens” of experiences for players to enjoy using the kit’s basic virtual reality (VR) technology. Here’s a preview of some of them. Ocean Camera (Toy-Con Camera) - Complete goals by taking pictures of sea life. House Camera (Toy-Con Camera) - Interact with a “strange creature” that’s living in the in-game house, and complete missions by taking pictures around the house. 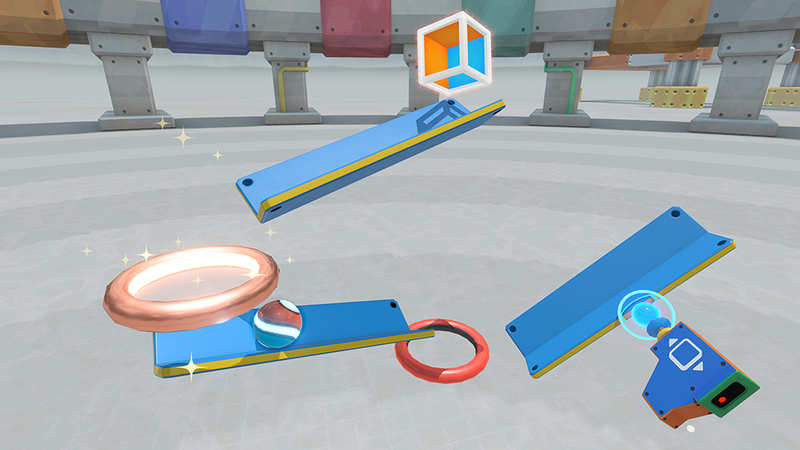 Marble Run (Toy-Con Elephant) - Use objects to guide marbles through rings to complete puzzles (the game is pictured above). Players can create their own puzzles for friends and family to complete. Doodle (Toy-Con Elephant) - Create 3D masterpieces by moving the elephant’s trunk around in the air. Players can show off their creations on the TV by docking the Switch. A multiplayer version of this game is similar to Pictionary, in that it will let players take turns drawing and guessing what other players have created. Bird (Toy-Con Bird) - Fly through the air on a bird’s back by flapping the wings of the Toy-Con Bird to fly, and titling to turn. Players will be able to collect items and help baby birds hatch as they play. Bird Dash (Toy-Con Bird and Toy-Con Wind Pedal) - Fly through checkpoints to complete timed challenges. The Wind Pedal will be used to give players a boost of speed. It will also send a rush of air toward the player that will make them feel like they’re flying. Blaster (Toy-Con Blaster) - Defeat aliens and other bosses in this shooting game. Kablasta (Toy-Con Blaster) - In this multiplayer game, players will need to shoot different kinds of fruit at hippos with the goal of feeding them as much as possible to earn points. Hop Dodge (Toy-Con Wind Pedal) - Become a frog and avoid obstacles as you jump as high as you can on a stack of balls. VR Plaza (All Toy-Con) - This area contains 64 “bite-sized games and experiences.” Nintendo said some of these can be played using only the VR goggles and the Switch system itself. In addition to these games and experiences, players will be able to create their own games and more in Toy-Con Garage, a playground of sorts that lets players toy around with basic programming tools. The Toy-Con Garage mode was also included in other Nintendo Labo kits. 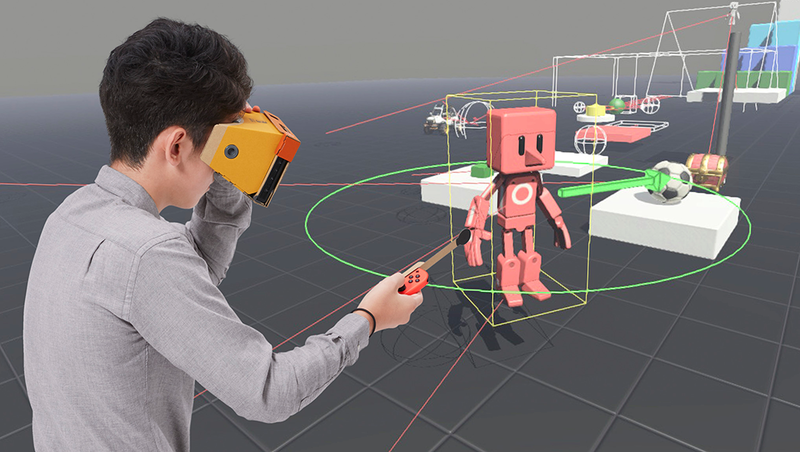 For the Nintendo Labo: VR Kit specifcally, a special Toy-Con Garage VR tool will allow players to create their own virtual reality games and experiences as well. Players can pull games from the VR Plaza into the Toy-Con Garage VR mode to see how they function, or even customize them. 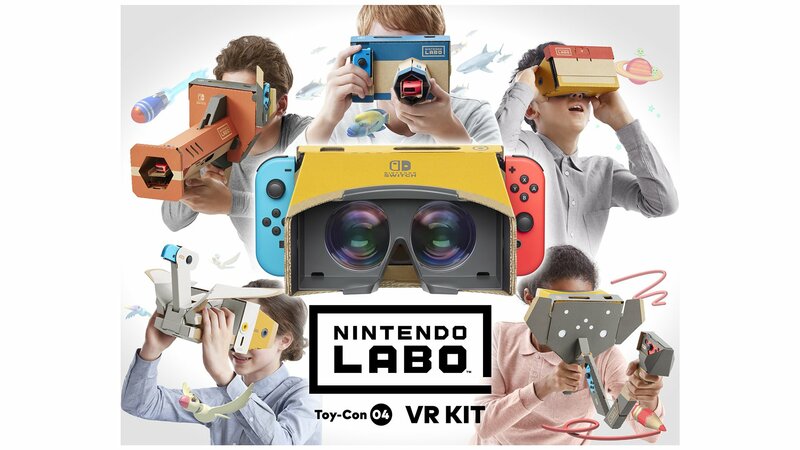 While the content in Nintendo Labo: VR Kit is family-friendly, Nintendo said the virtual reality experiences should only be used by kids aged 7+. Parents can turn off the VR feature and let younger players use the kit’s Screen Holder, rather than the VR goggles, to enjoy the games in 2D. Nintendo Labo: VR Kit will be available to purchase in two different versions. The standard Nintendo Labo: VR Kit will be priced at $79.99, and it will include everything players need to create all six Toy-Con projects, as well as the Switch software. It will also include the Screen Holder and a Safety Cap. The Nintendo Labo: VR Kit - Starter Set + Blaster will be available for $39.99. It will include the Switch software, Screen Holder, and Safety Cap, as well as the materials needed to create the goggles and blaster Toy-Con. Those who purchase the Starter Set will have the option to purchase two Expansion Sets later on, if they want to see more of what the VR Kit has to offer. Expansion Set 1 will include the elephant and camera Toy-Con projects, while Expansion Set 2 will include the wind pedal and bird projects. Each Expansion Set will be available to purchase for $19.99 exclusively on Nintendo’s website.